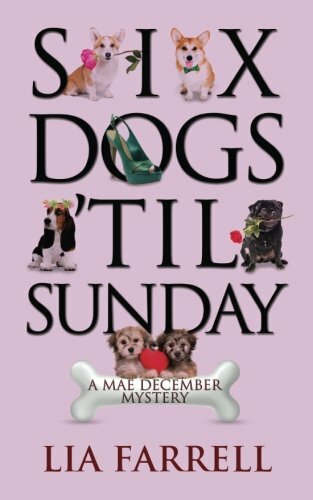 “Six Dogs ‘Til Sunday” is the final book in the Mae December mystery series by Lia Farrell. Things are heating up in the town of Rosedale, Tennessee, when a man dies of a gunshot wound shortly after driving himself to the hospital. This interrupts Mae December’s busy wedding plans to the handsome Sheriff Ben Bradley. It also stirs up a lot of memories of her deceased fiancé, especially after she discovers a link between the recent murder, and his supposedly accidental death. Mae’s interest is initially piqued, because the recently deceased man was part of a movie crew that was filming at a nearby home owned by a former sheriff. Right after the film crew discovers a hidden safe, the victim is shot while apparently removing money from it. Since the former sheriff didn’t leave his office on good terms, it is immediately suspected that the money didn’t come from legal means. As the mystery starts to unravel, Mae discovers some shocking information about her fiancé’s death. In a sense this also gives her closure so she can move on to her new life with Ben. “Six Dogs ‘Til Sunday” was actually my first book in the six-part series, but in spite of not having read the others, I will admit that it stood well on its own. The mother/daughter writing team of Lia Farrell, does a great job of seamlessly bringing everyone up to speed on the characters and their roles. The main characters are likeable, and I felt sympathy for all that Mae had to process to move forward with her marriage. While “Six Dogs ‘Til Sunday” by Lia Farrell is a light mystery, there is still a great deal of depth in these pages and it will keep you guessing. The dogs play a small role in this story, but I enjoyed the parts they did play. Bringing that past into the present really gave the plot a nice twist. I know that dog loving mystery fans will enjoy reading this one. As for me, I have five more books to read!